Couple of V’s friends had been reminding me of cookies that I once gave them over a year ago. They had absolutely loved those. I have not been able to recreate the same ones but I made another batch using a basil cookie recipe which I shared last year. The recipe is simple and why I went back to it was because it doesn’t use butter for cookies but olive oil or any oil of your choice. A batch of this duly went to the friends and rest were thoroughly enjoyed by my kiddos. 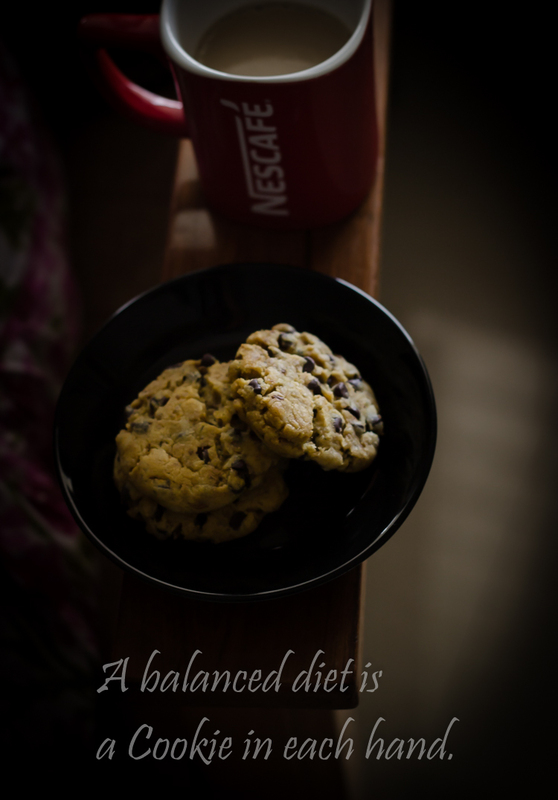 The cookies are soft and chewy with just a little hint of garam masala for the flavour. I think I would add a little bit more of garam masala next time. Over to the recipe now. 1. In a large bowl, whisk together all purpose flour, baking powder, baking soda, all spice powder and salt. Now add the chocolate chips to the dry ingredient mixture and gently toss to coat. I would have liked adding more all spice powder. You can safely increase to 1 teaspoon or even more.